We have to admit that when we dreamt up a pound cake grilled cheese with fig jam and rosemary butter, we thought that it was pure genius. The buttery, sweet bread crisps up so beautifully and when paired with sweet and earthy fig jam, and creamy brie, well the combo gets even more delicious. We've served this sandwich for breakfast with a side of bacon, for dessert with powdered sugar on top, and pretty much any time that we've had pound cake around. Begin by laying half of the brie onto one slice of pound cake. 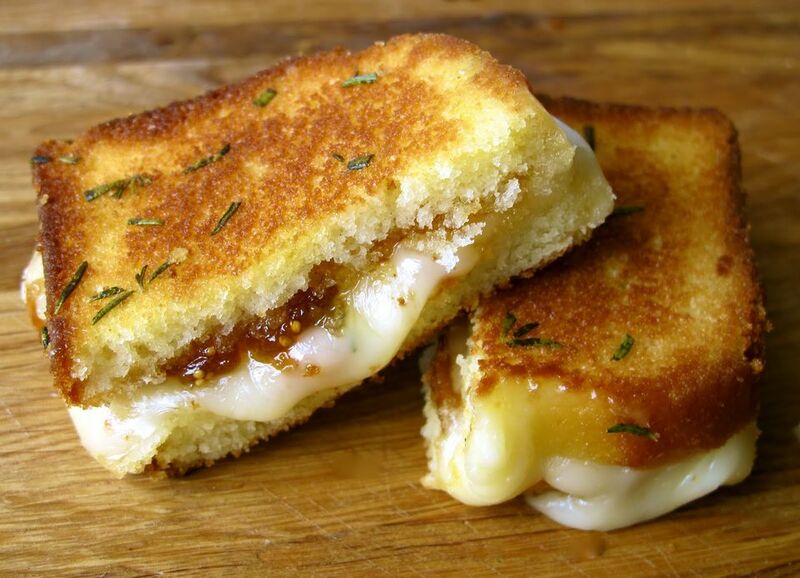 Then smear on some fig jam on top of the cheese slices. Add the rest of the cheese and put the other slice of pound cake on top. Set sandwich aside. In a small pan, smear some of the butter around and turn the heat to medium. Once the butter has begun to melt and bubble, add the chopped rosemary and stir until fragrant. Let it cook for a few minutes so that the rosemary infuses into the butter. Now add your sandwich and let it cook in the rosemary butter until the bread has begun to get crispy and the cheese starts to melt. At this point, add some more butter and rosemary to a different section of the pan and repeat the process - allowing both sides to cook in rosemary butter. When both sides are evenly golden, remove the sandwich from the heat and let sit for a few minutes before serving.